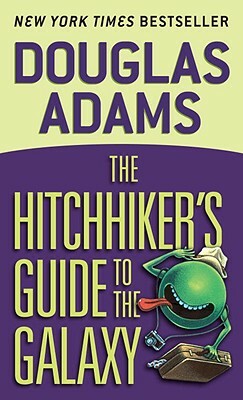 Douglas Adam’s The Hitchhiker’s Guide to the Galaxy is a crazy, crazy book. And I mean that in a totally good way. Seconds before Earth is destroyed to make way for an intergalactic freeway, Arthur Dent is whisked away by his close pal, Ford Prefect, who’s been posing as an out-of-work actor for the last fifteen years… even though he’s really a researcher for a revised edition of The Hitchhiker’s Guide to the Galaxy. And thus begins a wild journey through the galaxy, during which the two friends meet with out-of-this-world adventure and an assortment of zany characters. The characters we are introduced to throughout the course of the story are a truly delightful bunch. There’s the hapless protagonist Arthur Dent, who can’t seem to view the demolition of his home planet with the same flippancy that his friend – the intrepid Ford Prefect – does. There’s Zaphod Beeblebrox, a double-headed ex-hippie endowed with extra appendages who also happens to be the President of the Galaxy; as well as his girlfriend, Trillian (whom Arthur once tried to pick up at a cocktail party on Earth). We also meet Marvin, a paranoid, chronically-depressed android. He’s positively hilarious (though I’m sure he wouldn’t think so). Vogon poetry is of course the third worst in the Universe. The second worst is that of the Azgoths of Kria. During a recitation by their Poet Master Grunthos the Flatulent of his poem “Ode to the Small Lump of Green Putty I found in My Armpit One Midsummer Morning” four of his audience died of internal hemorrhaging, and the President of the Mid-Galactic Arts Nobbling Council survived by gnawing one of his own legs off. Grunthos is reported to have been “disappointed” by the poem’s reception, and was about to embark on a reading of his twelve-book epic entitled My Favorite Bathtime Gurgles when his own major intenstine, in a desperate attempt to save life and civilization, leaped straight up through his neck and throttled his brain. I highly recommend The Hitchhiker’s Guide to the Galaxy. It’s not altogether perfect, but it’s certainly worth your time. It’s science fiction laced with laughs – and I can hardly think of a funnier book I’ve read all year. @Eustacia: Yeah, the old “five books to a trilogy” thing. 😀 Love it. I’m certainly looking forward to reading the rest of the series. @Sweetie Pie: I haven’t seen the movies, though a friend recommended I watch the old BBC miniseries as opposed to the more recent film adaption. @Corey, I understood the newer version better but that was probably because I was older. they are both good. Some of the most entertaining books I’ve ever read. Lots of laugh-out-loud content. this was by far the best 5 book trilogy i have ever had the pleasure of reading. i have read them all at least 5 times and i still find myself laughing out loud and i am constantly making references from the book.the only other series that even come close to the fun and enjoyment i got from reading them was thieves world and the myth series both are from Robert Lynn aspirin.